When do we know that a collection at a Fashion Week is a Hit? When you start seeing people wearing them afterwards because latest fashion is defined by these fashion shows. Yes Models and Celebrities are requested (or maybe even paid) to flaunt by some designers but let's face it, the good designs stand out no matter what. 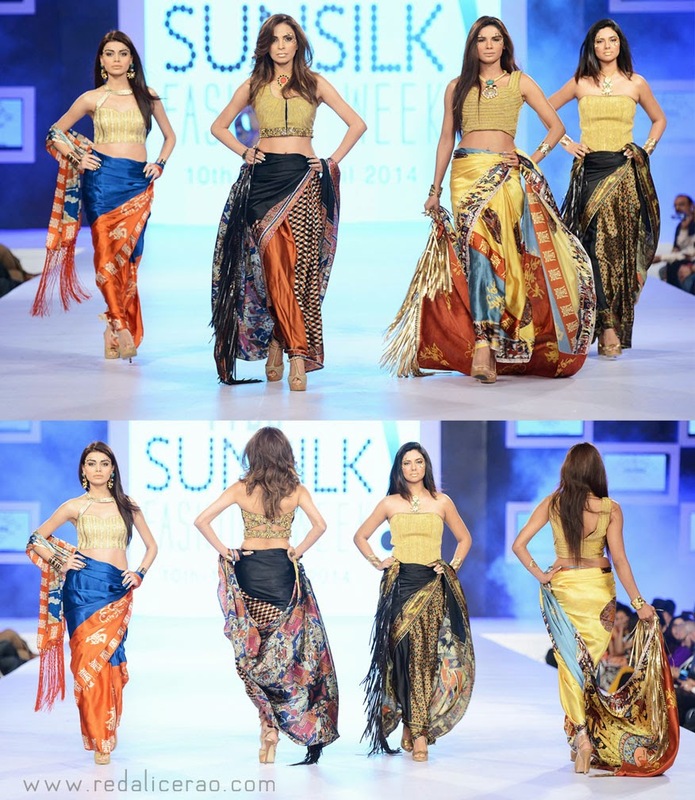 Pakistan Sunsilk Fashion Week 2014 was quite an extreme this year for me. A few Hits in this fashion show, but overall quite didn't get there. For me a Fashion Collection is like a soundtrack. One song is good? Nice. The entire soundtrack rocks? I buy it and so does everyone else. That is pretty much the WHOLE deal with most things. Who am I to judge? An ordinary woman, with some knowledge and good aesthetics regarding fashion who passionately writes to express how she perceives. No I am not a fashion journalist (though despised by many who are), I am not a Fashion Designer either (but a year in Textiles and good design skills is still better), however many dont know I used to be a fashion Photographer and stylist (for TVCs) if that settles anything. 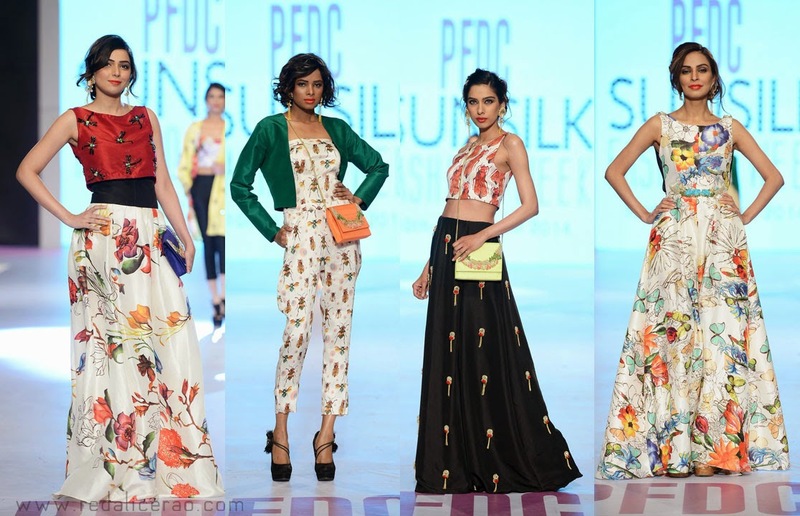 ANYWAYS, getting back on the fashion track I will try to keep it short and sweet with a selective few who were Superb (in my eyes, you can hate them, its cool) this PSFW 2014. Take a Fashion Pot. 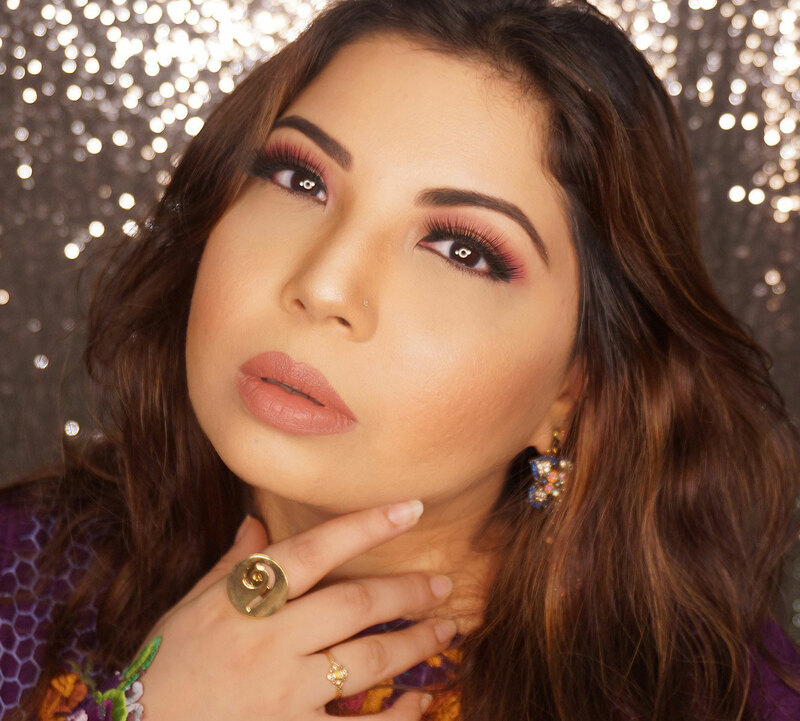 Add some Gold, Spikes'n'studs, Silk, Prints, add a dash of Shehla and we have a glorious "Glamazonian Daazler" (FYI: 'Dazzler' is the new 'Bling'). The collection this year has taken a different route. Last year's collection was minimal, focusing on drape and fabric mostly. This year it was all about detail. Detail in multicultural prints and embroidery, experimenting with cuts as well as texture and fabric. I saw more color as well. The overall collection was rich, her own jewelry designs added the pizzazz and I can see anyone wearing it striking a glamorous pose, cause its definitely worthy. One word that always connects with Ali Xesshan is GRANDEUR, perhaps the only thing relating his current collection to his concept. 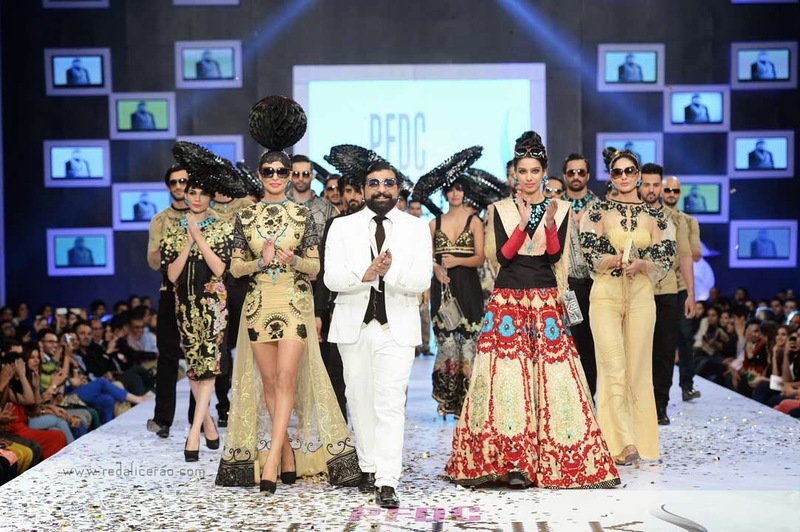 Even though the inspiration was the Golden age of Pakistani Cinema, I saw more of Renaissance patterns with straight cuts with hints of Portugal inspiration. The stylized bolero-like head pieces were super glamorous. 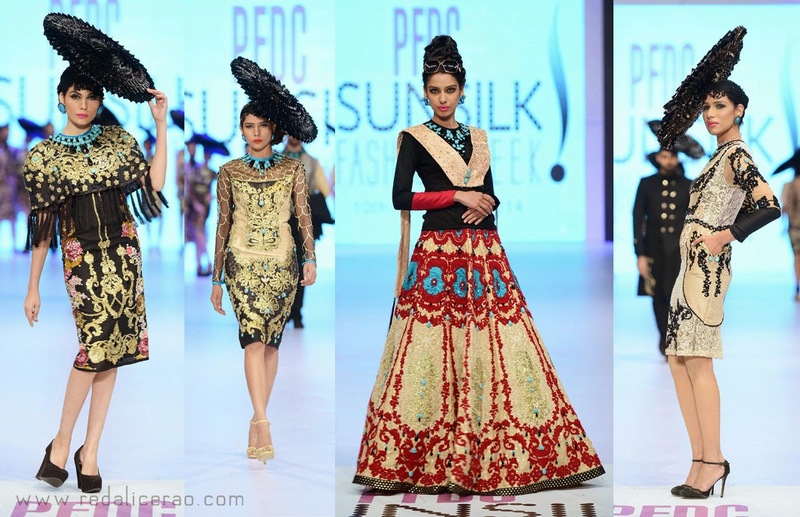 The embellishment was heavier and feroza was spotted, the used of embroidered lace noticeable and some reminiscence from the previous Bridal Couture...no? D&G and Roberto Cavalli popped in my head when I was reviewing this collection, however that is actually a compliment as I didn't see copy, I saw inspiration being transformed into beautiful art work. Overall it didn't fail to amaze, yet again. P.S: The Body Tattoo shirt must have definitely made every metro-sexual's heart skip a beat (oh well, maybe Almost). This collection has seriously blown me away. It's not only original but its has done everything RIGHT. The translation of art through different textures, fabrics, prints, layering, I can just go on about the Wow factors. Her inspiration of vintage fashion sketches by Rene Grau truly took perfect form in this delicious array of fashion fruit cake, every slice a different taste all together. From pop to text, the trending kitty to the graphic dots, embellishment has a whole new meaning here. Honestly, Elan has been a very eastern formal wear favorite which had gone a little silent in the past few years. This collection brought it back to life with a Snap, Crackle and POP. 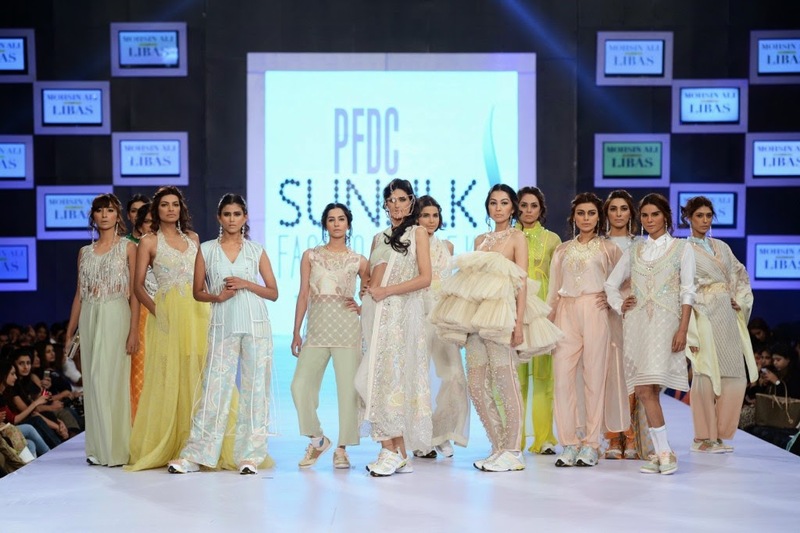 The Rest of the PSFW 2014 collections were not bad but fashion needs to woe its audience and most failed to find a place in my mind or heart. 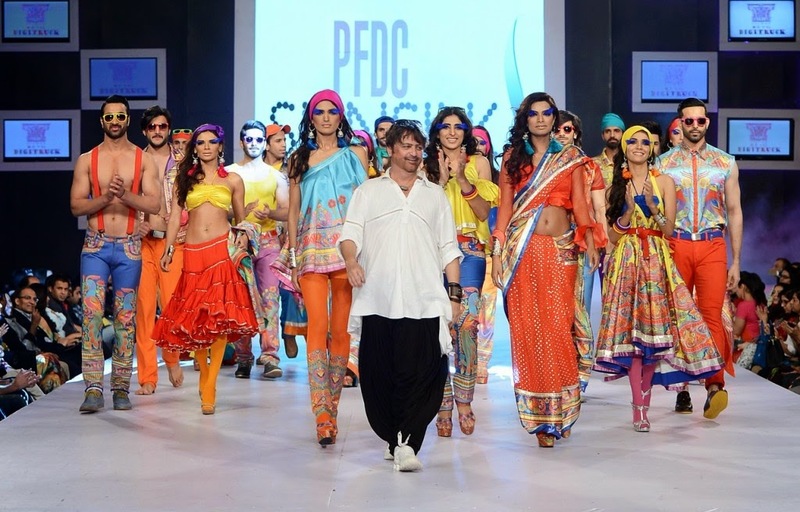 Notable mentions however goes to Mohsin Ali for being more retail friendly while keeping the edge on (dude the sneakers were awesome), Rizwan Beyg for evolving the 'Truck Art' into a more retail friendly cuts and fabric while not straying from his love of Truck Art (we will NEVER get enough of truck art) and Beech Tree for adding glam to High Street Fashion. 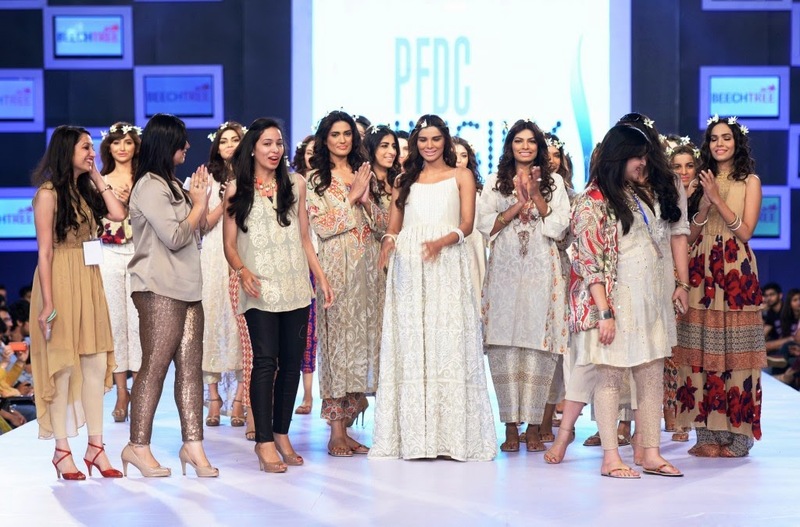 Loved those Shehla Chatoor & Elan pieces. Thanks for sharing.